A flexible modal dialog. It can display custom HTML or a standalone page. Supports drag&drop moving and automatic height adjustment. Open-source. Includes the main file (daypilot-modal.js) and ASP.NET WebForms helpers (C#/VB). Whether the height should be increased automatically to avoid scrollbar, until .maxHeight is reached. If set to false, stretch() will be registered to onload event and fired after PostBack as well. Note: Since 2.6, this property is ignored. Use .theme instead. Default value: "1px solid black"
CSS class of the main div. The internal iframe object used to display a standalone page using .showUrl() will be removed from DOM. If set to false, the DOM object will be cached and reused on the next .showUrl() call. Whether modal window dragging should be enabled (move it by dragging the border). Height in pixels. If autoStretch is enabled, this is the minimum height. Position of the modal dialog from the left. If not specified, the modal dialog will be centered. HTML to be displayed in the modal window before the target URL loads (only for .showUrl()). Maximum height in pixels when using autoStretch. If not set, it will be stretched until the bottom space is equal to .top. Opacity of the background hiding div (0-100). Whether the modal should scroll with the page or stay at the same position (fixed). Specifies the CSS theme used to style the modal dialog and the background div. Y position of the modal dialog in pixels. Whether iframe should be used to display the modal dialog content. Only applicable for showHtml(), iframe is forced when displaying a separate page using showUrl(). Width of the modal dialog in pixels. z-index of the background hiding div. Called before the dialog is to be closed. You can cancel the action here using args.preventDefault(). This event handler is called when the dialog is closed. The result passed to DayPilot.Modal.close(result) will be available as args.result. Called before the dialog is displayed. You have a chance to modify the DOM here in case of showHtml(). It is possible to open another modal dialog from an already open dialog. You need to create the DayPilot.Modal instance on the main page (not inside the modal) and access it using window.parent. If autoStretch is set to true (default) the window will stretch its height automatically to avoid vertical scrollbar. Call DayPilot.Modal.close() from within the modal page. The optional parameter will be passed to .onClosed event handler. Note that the client-side library (daypilot-modal.js) has to be included in the modal page as well. You can pass a custom object to the modal dialog when closing it. You can access this object on the client side in onClosed event handler. .onClosed event handler replaces .closed property. The event handler receives an "args" parameter. Autostretching will adjust the width first (in order to fit elements with fixed width). DayPilot.Modal.close() method that can be used from within the dialog to close it. It replaces the parent.DayPilot.ModalStatic.close() call. Requires the daypilot-modal.js file to be included in the modal page source. DayPilot.Modal.opener() added. Lets you access the open DayPilot.Modal instance from within the modal window. Global "box-sizing: border-box" compatibility fixed. New onClose(args) event that when the modal is about to be closed. Allows canceling the action using args.preventDefault(). CSS themes suport (.theme property). Disabled properties: border, corners, opacity. New .left property (centered if left is null). New .disposeOnClose property (default true). Not forcing useIframe = true for showUrl(). Promise success on modal cancellation for alert(), confirm(), prompt(). Full CSS styling for (padding replaced with theme styles) for alert(), confirm(), prompt(). Customizable button text (options.okText, options.cancelText) for alert(), confirm(), prompt(). Simple helper for replacing alert() with a more flexible HTML-based modal dialog with support for CSS styling. ASP.NET web application for managing hotel room reservation. Includes sample code in C# and VB. Sample SQL Server database. ASP.NET web application for displaying and editing weekly timetable with support for recurring events (daily, weekly, monthly, annually). C# and VB source code. Sample SQL Server database. Angular 6 project with Scheduler component that allows creating and editing events using a modal dialog. Tutorial with source code - PHP web application for hotel room reservation with HTML5 user interface supporting drag and drop. MySQL and SQLite databases. 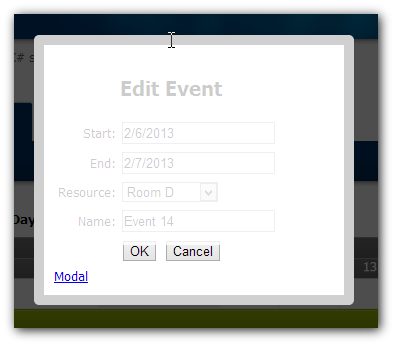 How to use the event calendar and ModalPopupExtender to create new events and edit existing events in a modal dialog.